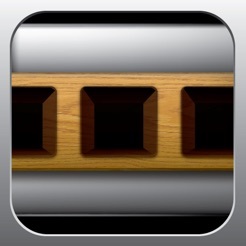 Harmonica Key is a music reference app for harmonica players. 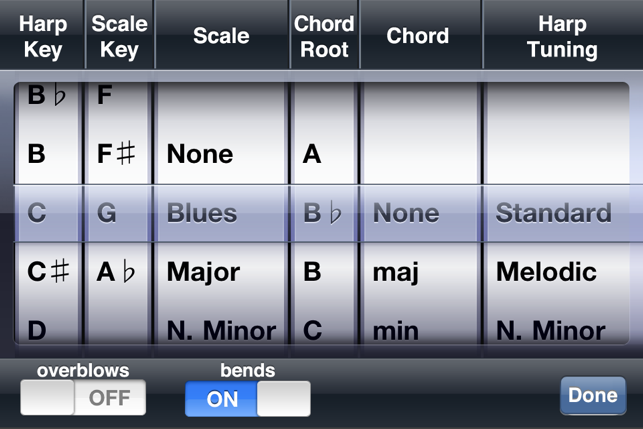 The app provides a simple interface for looking up common harmonica tunings, as well as overlay information about chords and scales. 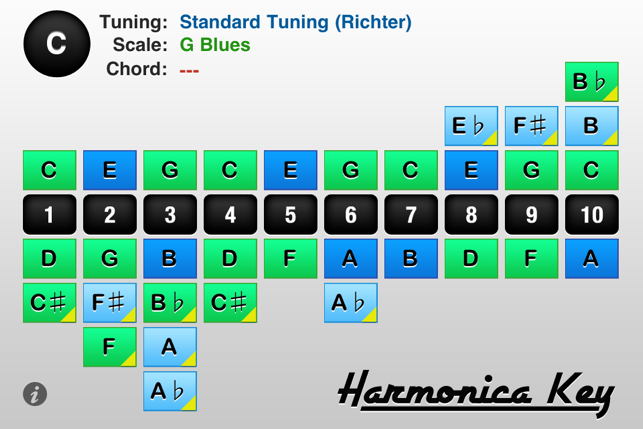 Players can choose to display information for different key scales and chords as well as change the root key of the harmonica. In addition, reference sounds are played when a note is touched to help players get the correct tone for bends and overblow notes. I think this serves a purpose for harmonica players who want to take their music to the next level, understand scales, and this may sound funny but what notes they are actually playing. I would really like to see an app (or the addition to this app) where I can simply select a key of harp and it will chart out the positions and what holes fall into each position. So if I want to play in 3rd position on an A harp, it will give me the layout. Will you consider this? Thanks....I think you are on the right track, though. If you are trying to learn how to bend and over blow on the different keys of the harmonicas this is the app .When you're learning to bend and overblow what are those notes supposed to sound like ? This app lets you hear what that note should sound like. This is a real harmonica learning tool. This is working on my iPad air. If you know the song key, this will show you which harp keys work with the song , shows you how many "sweet" notes you have in each different harp. I wish it would default to the "best" matching harp for the song key, you have to do a little digging to find the best one. But I am a fan! Thx for the app!